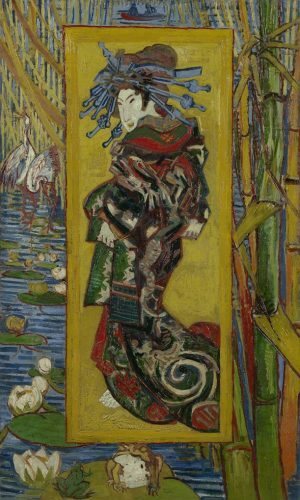 Major international exhibition on the influence of Japanese art on the work of Vincent van Gogh. The show, which comprises around 60 paintings and drawings by Van Gogh and a rich selection of Japanese prints, highlights the painter’s all-embracing admiration for this art and how fundamentally his work changed in response to it. Exceptional loans from museums and private collections from all over the world are brought to Amsterdam, including a Self-Portrait with Bandaged Ear, 1889 (The Courtauld Gallery, London). Van Gogh’s discovery of Japanese printmaking proved decisive to the direction he would take as an artist. He fell under the spell of the ukiyo-e – 19th-century Japanese color woodcuts – during his time in Paris (1886–88), and began to collect these prints on a large scale. Exhibition presenting Chinese painting, calligraphy, poems and a selection of ornamental and interior objects, created in and around the eighteenth century. All this is presented together with the unique eighteenth-century Chinese wallpaper of Museum Oud Amelisweerd. On show are decorated lacquer ware, fans, textiles, ceramics and silverware, especially made for the western elite produced in Canton. Among the highlights of the exhibition is an eight-part folding screen of Chinese lacquer ware, painted in great detail with gold and paintings by the most important Chinese masters including the famous Wang Hui (1632-1717) and Jin Nong (1687-1733), from the collection of the Guangdong Museum in China and on display for the first time in Europe. Exhibition of Asian maps. On show are some 30 maps and objects depicting Asian countries. The maps are not objective but the vision of the person who designed it, the maker and the client. They show peoples imagine a certain area: what is there to find and who is in charge, for example. Among the highlights on show is the reconstruction of a huge map of the Chinese empire. At the beginning of the eighteenth century, a team of cartographers worked together on this largest cartographic project ever. Exhibition about the battle stage of the Samurai. Among the highlights on show are the Nō-masks and the masks of the famous Japanese samurai warriors. Artifacts from international and private collections, including swords, screens, kimonos, helmets and bows, illustrate the beauty and power of Nō-theatre and the samurai culture. Feared on the battlefield, the fascinating samurai of ancient Japan were also patrons of the arts and learning, and led a refined and cultured life. The samurai practiced various forms of artistic expression, such as calligraphy, ikebana, painting, and the tea ceremony. The passion with which the warlords studied, observed and even practiced Nō-drama was extraordinary. Their love of the fine arts spilled over onto the battle field. The impressive armor not only protected the samurai in battle, it was a reflection of his personality and status. The masks, helmets, cuirasses and swords were made by the very best craftsmen, using precious metals, beautiful lacquer ware and costly fabrics. This year’s edition of one of Europe’s prime international art and antique fairs, at which 260 selected dealers from Europe, North and South America present highlights from their collections. Exhibitors will show some 30,000 works of art and antiques, including paintings, drawings, prints, sculpture, furniture, classical antiquities, illuminated manuscripts, jewellery, textiles, porcelain, glass, silver, design and Asian art. Exhibition marking the digitization of the archives of the Dutch East India Company (VOC). The archives are kept in archives in various countries around the world and a large portion is preserved in the National Archives. They contain a wealth of information and have served as a unique source for research for many years. The National Archives brings this remarkable material together for the first time in a single exhibition. Arts biennial focusing on the traditional and contemporary culture of Indonesia through artistic exchanges, new creations, exhibitions, dance, music – with a special focus on gamelan -, literature and film. Since 1969, EUROPALIA has been organizing arts biennales, each focusing on a different guest country. Its four-month multidisciplinary program comprises hundreds of events throughout Belgium and other European countries. Exhibition about the people of Indonesia, focusing on cultural and religious exchange with other countries down the centuries that have influenced the arts, identities, and even the worldview of Indonesians. On show are 160 archaeological and ethnographic treasures that have been loaned by the National Museum of Indonesia and are being shown for the first time in Europe. Some thirty other works come from European museums and private collections. Most of the cultures of the archipelago find their roots in Austronesian culture, brought by migratory peoples who left Taiwan more than 5,000 years ago. The splendid Dong Son culture of North Vietnam, known for its mastery of bronze, was also influential. Trade was often the source of these exchanges. In the 5th and 6th century, Indian merchants, monks and traveling students brought Buddhism and Hinduism to Sumatra and Java. These cultures have shaped the relationship of Indonesians with their ancestors. They worship their ancestors, enriching them with their particular musical tonalities or, by contrast, attempting to destroy them. Thus in Indonesia, we find Buddhist and Hindu objects and stories that emphasize the importance of ancestors, an Islam that is open to pre-existing ancestral cults, and the scars of European religious conversion whenever it did not destroy works of art or influenced local artistic production. Exhibition, the outcome of a collaboration between Indonesian, Belgian, French and Dutch institutions and scientists, retracing the history of a region of the world that is rich in spices, gold and precious wood, and yet often misunderstood. Most of the works on show come from the National Museum of Indonesia in Jakarta, exceptional national treasures of which many are making their first ever journey outside Indonesia. They are complemented by rarely exhibited works from the Musée Royal de Mariemont and the Musée national de la Marine in Paris, as well as from private collections. The history of the archipelago is one of a multitude of links and connections, where the near and distant rub shoulders, set in competition by an omnipresent maritime world. The sea gathers more than it separates, and the monsoon winds have made this crossroads an obligatory stop for merchants, religious people and foreign diplomats whose presence has left traces in the myths, monuments, art and traditions of contemporary Indonesia. Superimposed, mingled, reinterpreted by rich and complex societies, these external influences have forged multiple worlds, which the relationship with the sea has finely colored and chiseled. Exhibition about the fascinating world of samurai, tracing the history of these warriors and brings them to life. Fierce and fearsome warriors, devoting their lives at the Bushido, a strict code that required loyalty and honor until death, samurai are the symbol of Japan’s history. Among the 250 works on show are a complete armor, helmets, masks, and weapons. With the long period of peace that settled from the seventeenth century onwards, this class of warriors has, in fact, transformed into a new nobility that forms the intellectual elite of Japanese society. While practicing martial arts, the samurai then indulged in new, more refined disciplines, contrasting with the violence of the art of combat, such as calligraphy, poetry, literature, and the tea ceremony and the incense game. Exhibition illustrating the Asian journey of Émile Guimet (1838-1918) and painter and illustrator Félix Régamey (1844-1907). In 1876 the two embarked on a long trip to Japan, China, Southeast Asia and India. During this trip Guimet studies the religions of the Far East. This research leads him to create a museum for which he acquired many objects. At his side, Régamey draws sketches. The two men on the roads of Asia are bound by a friendship and a deep respect. This friendship between Guimet, a wealthy industrialist from Lyon, and Régamey, communard and press cartoonist, is illustrated at the heart of the exhibition as an intimate story filled with compassion, created from a selection of small and large format paintings, photographs, drawings, personal items and letters. The museum will travel first to Lyon then to Paris. In his search for completeness and in his desire to understand religions, the scholar Guimet reports an extraordinary Buddhist pantheon. An insatiable collector, he is one of the most astonishing figures of his time, who deeply marked the history of taste for Asian arts in France. Exhibition of antique photographs, unveiling one hundred photographic works – exceptional images of Burma of the second half of the 19th century and a rare collection never exhibited before. The selection was made from the entire Burmese collection acquired by the museum in 1989, completed with new acquisitions from 1992 to 2015 and enriched by recent donations. The aim is to observe Burma during the British colonial era, through an exclusively European lens, and to invite the visitor to on an exploratory trip that offers a story with many facets and surprising landscapes, sometimes rough and then again refined. This year’s edition of the annual arts and antique fair, aiming to create a dialogue between modern art, historical and contemporary design and jewelry. The engaging aspect of the PAD fair is its invitation to enter a personal collection, conceived by a selection of local and international art dealers – all of whom are leaders in their fields, eager to address each passionate collector in a unique manner. PAD, pioneering events for Art and Design aficionados and collectors, has been reinventing the Cabinet d’Amateur and a notion of eclecticism for the past 19 years, anticipating the esthetic aspirations of its time. First exhibition explicitly dedicated to Chinese portrait painting. A selection of more than 100 paintings from the collections of the Palace Museum Beijing and the Royal Ontario Museum Toronto, most of which have never been shown in Europe, extending over a period of more than 500 years. The main focus is on the unique portraits of the Qing Dynasty (1644–1912), including images of members of the imperial court, ancestors, military figures, and informal portraits of artists and famous women. Portrait painting has a 2000-year-old tradition in China. Beginning in the middle of 16th century, the late Ming Dynasty brought with it an economic boom and great intellectual openness that spurred a significant moment of florescence. It was in this period that Italian Jesuit painters visited the country, such as Matteo Ricci, who brought new techniques of European portrait painting with him in 1583. After the Manchu people conquered China in 1644 and established the Qing Dynasty, the imperial court in Beijing was host to a lively cultural exchange between China and Europe. This is particularly well reflected in the portrait paintings. The Jesuit painter Giuseppe Castiglione (Chinese name: Lang Shining; Milan 1688 –Beijing 1766) is a key figure of this period. Exhibition presenting around 22 Indo-Islamic paintings from the Mughal era that demonstrate the use of carpets in the courtly context. The Mughal emperors were Islamic rulers, who reigned over vast areas of India from 1526 to 1858. Babur, founder of the dynasty, came from Persian-influenced Central Asia. He brought numerous customs to his new homeland, including the use of carpets as preferred furnishings. The paintings impressively demonstrate how the carpets animated the palace architecture, which was built from light and reddish stone. In combination with textile curtains and cushions of various sizes, they could be used flexibly and adapted easily to large areas, making it possible to create intimate resting places. They were also used to create textile rooms outdoors: on the terrace, on picnics or hunting excursions, and preferably in combination with color-coordinated mats, mattresses, and pillows. Exhibition dedicated to the art of imitation. On show is a selection of miniature paintings and calligraphies, created under the rule of the Islamic Mughal Emperors (1526-1858) in India. The show illustrates the broad spectrum of copying, ranging from the duplication of famous role models to their deliberate modification. Major exhibition of a selection of Japanese color woodcuts from the collection of the museum of East Asian Art. The Japanese color woodcut still belongs to the art genres of East Asia, which are popular in Europe thanks to Japaneseism and are therefore still being collected and traded. After more than 100 years, the Museum of East Asian Art has traversed its woodcut depot and for the first time show its collection of Japanese color woodcuts and books. The result is a selection of the most unusual and precious pieces presented in a large special exhibition. In addition to the primitive, hand-colored pieces of the 18th century, the museum has color prints from the world of amusement parks and the Kabuki theater (ukiyo-e) of the 18th and 19th centuries, depictions of historical warriors and heroes, (surimono), bizarre depictions of aliens from Nagasaki, an extensive collection of prints of the Meiji period with illustrations of the Sino-Japanese War, the Hokusai and Hiroshige series, depictions of flowers, birds, insects and fishes modern “new wood print” Shin Hanga since the Taisho period. A collection of important books complements the wide spectrum, including rare first editions of the manga of Hokusai as well as Mahlerbücher for Hobbymahler and -Mahlerinnen, which introduce the stylistic peculiarities of different painting schools. Exhibition of Indian painting honoring Eva and Konrad Seitz who donated a substantial part of their collection of Indian art to the Museum. The paintings created more than 200 years ago exhibit a striking degree of quality, subtlety and elegance. Outside India, the Museum Rietberg ranks among the leading institutions when it comes to Indian painting, especially with regard to works of the Pahari tradition from the Himalayan foothills of northern India. Display of Chinese New Year Prints. According to the Chinese lunar calendar, New Year falls on 16 February 2018. In China it is tradition to rid the house of all misfortune and pray to the gods for their blessing. In this context popular prints play a significant role. The colorful pictures provide insight into Chinese folk beliefs and reflect the woes and hopes of the general population. Exhibition exploring the intricate accessories worn by Japanese men during the Edo period (1615-1868). Netsuke are a form of Japanese miniature sculpture that were primarily functional, but evolved into an important art form. The show features a selection of netsuke, chosen from over 2,300 in the British Museum’s collection, with more pieces added from MEAA’s collection to show the range and beauty of these objects and their excellent craftsmanship. Netsukes come in a variety of forms and materials such as wood, ivory and porcelain. The beauty of these objects is in their individuality, and is reflected in the variety of the netsuke on show; a goldfish, a Chinese boy holding a lion mask and a drum and a fox’s mask. Also on display is a number of inro (a case for holding small objects), a sword, and smoking accessories. Cross-cultural display compares the rich and diverse traditions of Asian lacquer at the V&A, including references to the European tradition of ‘japanning’. Major exhibition exploring Buddhism, Christianity, Hinduism, Islam and Judaism, presenting the first to look at the art of the five world religions as they spread across continents in the first millennium AD. On display are objects created when the iconography of each religion was still being developed. Art and imagery were central to the spread of these systems of belief, and the visual identity of each religion was formed by encounters and interactions between different faiths and other traditions. This exhibition brings to light brand new research from a major project conducted in partnership between the British Museum and University of Oxford, generously funded by the Leverhulme Trust.